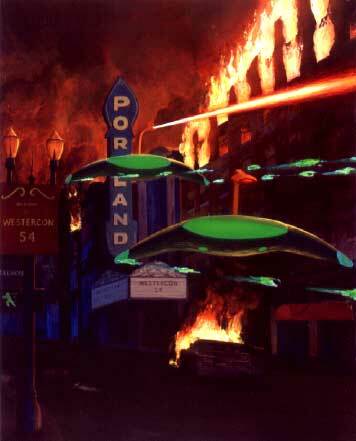 In 1953, at the age of eleven, I was thoroughly captivated by George Pal's motion picture, "War of the Worlds." Forty-eight years later my enthusiasm for his terrifying Martian war machines, "awesome in their power and complexity," had not diminished. This piece served as the cover art for the "souvenir book" produced for Westercon 54, held in 2001 in Portland, Oregon. As the convention's artist guest of honor I wanted to do something, especially for local fans, that would personalize the convention and make everyone feel right at home. Inspired by the movie, I asked convention organizers via the internet to take a few photos of city landmarks and e-mail them to me in jpeg format. 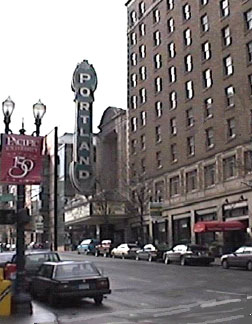 Choosing a well known downtown landmark, I used it to depict something I though fans would truly appreciate  the city of Portland, leveled to the ground.